On April 6, 1985, Maxim Brilinsky was born in Lemberg, where his mother was employed as a pianist at the conservatory. 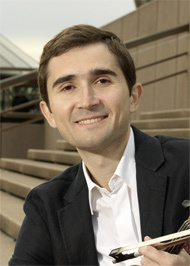 At the age of five, he received his first violin lessons at the music school there and beginning in 2000 continued his education with Michael Frischenschlager at the University of Music and Performing Arts in Vienna, where he passed his first diploma with distinction in 2004, while at the same time completing his high school education in Lemburg. As of 2005, he studied violin at the Conservatoire Nationale Superior de Musique et de Dance in Paris with Jean-Jacques Kantorow. After having served as concertmaster for the chamber ensemble "Orchestra d'Auvergne" in the 2006/07 season, he joined the 2nd violin section of the Vienna State Opera Orchestra on Sept. 1, 2008. Following another successful audition, he moved to the first violin section on September 1, 2011. Maxim Brilinsky was a stipendiary of the Herbert von Karajan Center in Vienna and the Thyll-Dürr Foundation in Zurich. He is the prize winner of many well-known international violin competitions: he won the 4th Prize at the Yehudi Menhin Competion in Boulogne-sur-Mer (2002); the 2nd Prize and a special prize at the Paganini Competition" in Genoa (2002); the 2nd Prize and a special prize at the Benjamin Britten Competition in London (2004). Numerous solo concerts in Germany, France, Italy, England, the Ukraine, Slovakia, Poland and Japan round off the artistic path that Maxim Brilinsky has consistently followed since early childhood.